Lexi Lighting is a young and fresh importer and wholesaler of innovative lighting solutions. Established in 1995, our factory in mainland China began exporting Christmas lights and lamps to Europe. Now, over 70% of Christmas lights sold in Germany are made in our factory. In Australia through our brand, Lexi Lighting we have taken the opportunity to provide value for our customers in getting them a better value product at the best price, by cutting out the middle man. Lexi Lighting works with young, creative designers to be a market leader in lighting, with a vision to introduce our innovative lighting solutions to the Australian market. 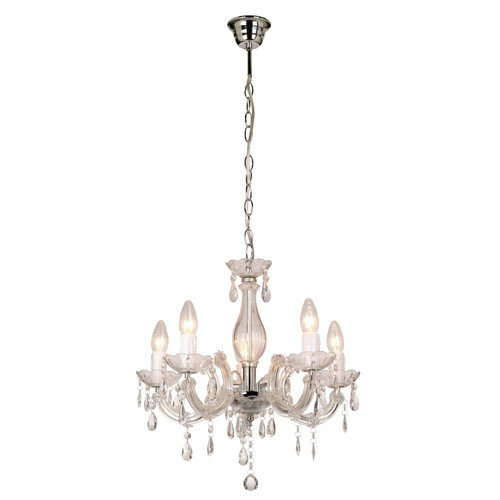 When you buy a Ambroise 5 Light Chandelier online from Temple & Webster in Australia, we make it as easy as possible for you to find out when your product will be delivered to your home in Melbourne, Sydney or any major city. You can check on a delivery estimate for the Lexi Lighting Part #: LL002CH005C here. If you have any questions about your purchase or any other Ceiling Fixtures product for sale our customer service representatives are available to help.Whether you just want to buy a Ambroise 5 Light Chandelier or shop for your entire home, Temple & Webster has a zillion things home. You need to look at least twice to see that it isn't the real thing. Looks lovelier in real life! Perfect for my daughter's bedroom as it is small and dainty. Pictures dont fo it justice!